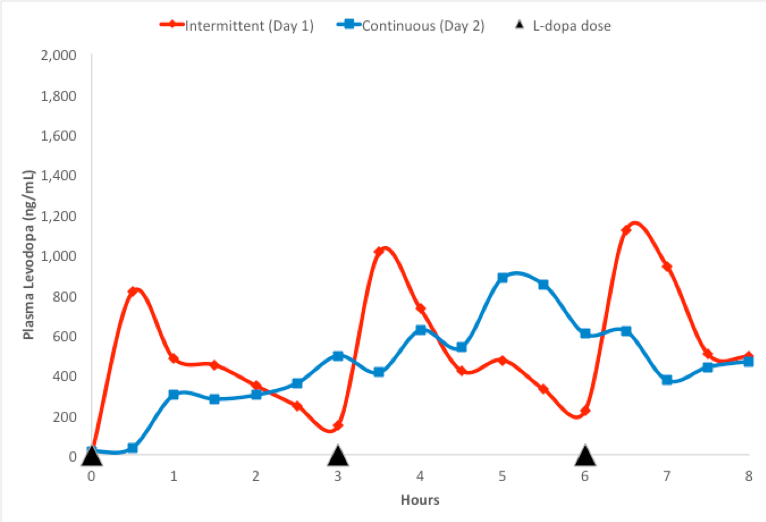 A SynAgile-sponsored proof of concept study tested the hypothesis that continuous administration of a LD/CD dispersion into the mouth would have superior pharmacokinetics and efficacy versus standard therapy with intermittent pills. A publication with the results is currently in press with Movement Disorders Journal. Objective: To compare pharmacokinetics and efficacy of intermittent versus continuous oral delivery of levodopa/carbidopa (LD/CD) in Parkinson Disease (PD) patients complicated by motor fluctuations. Methods: 18 PD patients with wearing off episodes were enrolled in an open label study. Pharmacokinetic and efficacy measures were assessed comparing treatment with standard intermittent oral levodopa and “continuous” oral levodopa. For purpose of this study continuous was defined as sips of a levodopa dispersion administered at 5-10 minute intervals. On Day 1 patients received their regular oral LD/CD dose. On Day 2 patients received the same total LD/CD dose via “continuous” oral administration. On Day 3 patients received their regular LD/CD morning dose followed by “continuous” administration of LD/CD. The total daily LD/CD dose was the same on each day of the study. Results: There was significantly less variability in plasma LD concentration with “continuous” versus intermittent oral levodopa treatment (fluctuation index was 0.99+/-0.09 vs 1.38+/-0.12 (p < 0.001) and coefficient of variation was 0.35+/-0.03 vs 0.49+/-0.04 to (p < 0.001)). The mean OFF time was decreased by 43% (p < 0.001) with “continuous” oral levodopa therapy. No treatment-related safety or tolerability issues were observed. Representative plasma levodopa levels following administration of standard intermittent oral (red) and continuous oral (blue) LD/CD in a single PD individual. Note that continuous oral delivery avoids the marked fluctuations and the periodic low trough levels associated with intermittent oral delivery. Conclusions: “Continuous” oral LD/CD therapy was associated with less plasma variability and reduced off time in comparison to standard intermittent oral LD/CD therapy. Double blind trials are planned. For more details, please view the publication here. In 2019, SynAgile will initiate a Phase 2 clinical trial treating people with Parkinson’s Disease with the DopaFuse system. For more information on the clinical trial, please contact us.